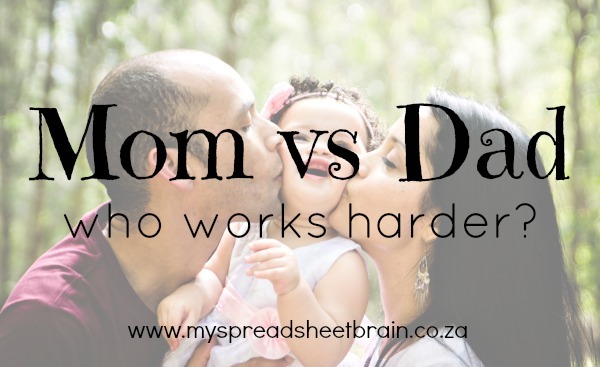 Mom vs Dad: Who works harder? Mom vs Dad: Who works harder? Okay, so, I know that it’s a pretty general question. I’m sure that there are a bunch of different responses that can come from it, since each person’s situation is unique. And the truth is I wouldn’t even be thinking these thoughts if I hadn’t just had the day that I’ve…uhh… just had. Anyways, I digress, a few hours later, Hubstopher was up for work, and I decided to stay at home with Curly. The day passed in a blur… doctors visit, trying to get this temperature to behave, washed bedding and clothes, attempted to wash my hair as quick as I can (if you could even call it that). Then her tummy started acting up too, so I’ve had to wash pillows and clean messes up from the floor (spillage)… it’s been fun and games guys… fun and games. And as it nears 5pm I am filled with thoughts of: “but wait, your dad will be home soon!” I mean, hello, it IS his turn after all… right? Lucky ol’ him got to spend the whole day at work, while I stayed at home to soothe, clean up and give medicine. I guess this is where compromise comes in. It’s a little give, a little take and a whole lot of “but how can I help you?” action that needs to be going on. Consideration makes the world go round and the home a happy place……. Must remember that when I’m cleaning the puke out of my hair later. Is it weird that I want to adopt?